fossil records, the crab has remained basically unchanged over the millennium. Oceanographers theorize the reason for the longevity is its ability to adapt an uncomplicated metabolism to a widely changed environment. It is perhaps fitting that the symbol of the Low Tide Yacht Club is the ancient horseshoe crab. While the purpose and spirit of the club remains as it was when it was founded in the 1930s, the sailing/boating environment it exits in has changed dramatically. Originally, a variety of small wooden boats with homemade sails and tar caulked hulls sailed for Low Tide from a small boat shed along the Acushnet River in New Bedford. This building was provided to the club through the generosity of Mr. Carl Beetle. Most members made their homes in the South End of New Bedford near the club site. The hurricane of Sept 21, 1938 carried away the small structure along with many pleasure craft in the area. The outbreak of World War II further dampened the sailing community and the activities of the club. It was during the war that a new material called "fiberglass" was being perfected that would eventually revolutionize the sport of sailing and boating. During the 1950s, local interest in sailing and the club once again began to climb. Many club members began to purchase the "Beetle Cat", a small wooden day-sailors built in South Dartmouth. The " Woodpussies", of similar design, were also popular. These boats provided an excellent way to expose younger members to boating. Racing the Beetle Cat's on Tuesday and Thursday nights became both popular and competitive, enhancing sailing skills. While the number of vessels in the club was increasing, they remained mostly small wooden boats, which had limited range and required many hours of maintenance (and bailing!) The mid 1960s saw the rise in popularity of fiberglass sailboats. 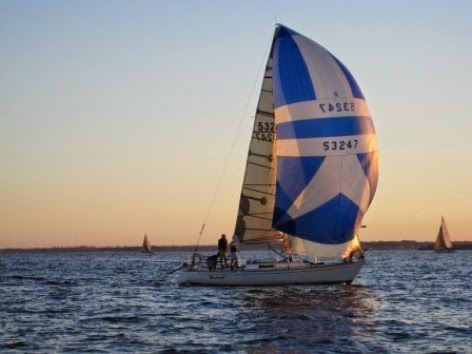 In April of 1966, two club members followed this trend, purchasing 22 foot "Ensigns" sailboats manufactured by Pearson Yachts of Rhode Island. With two more Ensigns bought the following year, this small fleet opted for a more "cruising"model and purchased 26 foot sloops also built by Pearson Yachts. The racing became more formalized in 1971 with the purchase of a 28 foot wooden power boat renamed "Limulus" to serve as a committee boat. By 1977 this group would expand to include nine boats and provided many moments of exciting racing. Despite the increase in membership, the club continued to lack a clubhouse. Board meetings were held either in members' homes or in the loft of Medeiros Ship Yard on Rodney French Blvd. in New Bedford. In April 1973, the Board of Governors entered into an agreement with the City of New Bedford to lease the WWI officers quarters building in Fort Rodman located a the southern most part of the city. In return, the club agreed to provide sailing lessons to the general public. Many hours were spent by club members in the remodeling of the building. This effort was credited with saving the structure, since at the time, no city funds had been allocated for its maintenance. With the exception of the winter months, the majority of events were now held at the refurbished club house. In 1983 in order to expand its commitment to sailing education, the Board of Governors formed the For Rodman Marine Education Association (FRMEA) as a subsidiary organization. All property of the Low Tide Yacht Club was transferred to the Association and it was granted nonprofit education tax status 501 (c) (3). The LTYC and FRMEA now coexist with the Board of Governors of the yacht club serving as the Board of Directors of the Association. The early 1980s began to see a decline in participation in club activities, in particular the Thursday night racing. By 1985, all of the active participants of the Pearson 26 Class had either sold their boats or dropped out of racing. Due to extensive repair costs, it was decided to dispose of the committee boat "Limulus". During the summer of 1986, often times only three boats could be found at scheduled races. The low point of this period occurred on May 6, 1987, when fire gutted the clubhouse making it uninhabitable. The club secured a much smaller building within the Fort Rodman complex, originally built as housing for the noncommissioned officers. Despite being dealt what appeared to be a deathblow, interest in the club actually began to increase. Many of the children of the founding members, who had literally "grown up" with the LTYC, along with an influx of new members began to take an active role in club management. Participation in racing as well as weekend cruises expanded and from 1988 to 1989, Thursday night races for windsurfers were held in Clark's Cove. Early in 1990, the club decided to reintroduce "on-the-water" training to its sailing education program through the purchase of two-man dinghies. After considering several designs, it was voted to buy three JY 15s, manufactured by J-Boats of Newport, RI. In addition, four JYs were purchased by individual club members, bringing the total fleet to seven. The Seaport Inn of Fairhaven agreed to provide space and storage for the JYs at no cost to the club. These boats greatly enhanced the effectiveness and popularity of the sailing education. During 1993, the program was at capacity with many people having to be turned away. When not being used for training, the club's boats were chartered to members for informal races on Monday evenings. The fleet was expanded in March of 1993 to a total of 11 boats with the club owning six of these. In 1992 the monthly newsletter, "The Main Sheet", was introduced to provide information on upcoming events, report race results and occasionally provide a humorous view of boating and the club. During the summer of 1992, the club was notified by the City of New Bedford that by year's end, it would have to vacate the building it had been occupying since 1987. This was due to the construction of sewerage treatment plant at the Fort Rodman site. A nearby building was kindly offered by the New Bedford Vocational Technical High School to serve as a clubhouse for the 1993 season. As this building was temporary, the board agreed to continue its search for a permanent clubhouse. Throughout 1993 numerous locations were explored. Unfortunately it was only after lengthy investigation that these sites were found to be either unsuitable or unavailable. In March 1994, the City of New Bedford offered the club use of the Victory Park Warming House located near Fort Rodman complex to serve as a clubhouse. Club members spent many hours cleaning the facility as well as upgrading electrical and plumbing service. Through the cooperation of the Bristol County Sheriff's Office, further improvements were made by participants of a work release program. During April of 1994 the club expanded its commitment to its sailing program by purchasing a 12 foot Optimist Dinghy. Several members also planned to purchase dinghies to create a small fleet. It was hoped that his would encourage younger members to participate in the sail-training program that the club offered. In pursuit of one of our main objectives as an educational marine association, the Board of Directors decided during the winter of 1996 to expand our Sailing Program to children. With the acquisition of 6 "Optimist Dinghies" and our fleet of JY15 sailboats the program was launched. The ambitious "Summer Sailing Program" of 1996 was a success with an enrollment of 90 students, of which 70 were tuition free "Children-At-Risk". This summer program encompassed three summer morning and afternoon sessions of Sailing Classes. Throughout its dynamic history, the Low Tide Yacht Club has endured and prospered. While the boats are no longer of wood, and the sails no longer of cotton, the spirit of the people who sail them is very much the same as those who formed the club over six decades ago.